THE KKKOALITION has signed its own death warrant. Hopefully. In supporting One Nation's Senator Pauline Hanson's toxic bilge that it's "okay to be white", the facile but dangerous Morrison Government deserves to lose not only today's Wentworth by-election, but also the pending Federal election. They are unworthy of our vote. They are unworthy of Australia. We are surely capable of better. No longer can we tolerate what is being said and done in our name by these belligerently racist and desperate buffoons, who shamelessly lie, cheat and steal from us by masquerading as a government. This was political expediency writ large and to describe its support of Hanson's motion as an "administrative error" indicates the contempt the Liberal National Party has for the national electorate and our intelligence. As if. They think we are fools. Where do these loons get off? Photo above supplied to Gus. It was modified to remove the identity of say a young liberal, possibly one of them brats in nappies, wanting to sell the ABC to Murdoch. The KKK of powerful men lost the seat of Wentworth to a nice lady. The high-profile independent Kerryn Phelps has pulled off a stunning victory in the Sydney seat of Wentworth, crashing through the seat’s 17.7% buffer, and forcing Scott Morrison and the Liberals into minority government. Phelps claimed victory on Saturday night eight weeks after conservatives rolled the popular former local member, Malcolm Turnbull, triggering a byelection contest that allowed Sydney voters to vent their anger, and strip Morrison of a working majority on the floor of the lower house. Voters punished the Liberals in all parts of the Wentworth electorate, even in rusted-on areas like Vaucluse and Double Bay, and the protest vote went straight to Phelps rather than to alternatives in the field. Counting in the byelection contest was still under way on Saturday night, but the swing against the government was over 20%, which is historic for an Australian byelection, and a shocking portent for the Liberals, who will face the voters between now and next May. The result wasn’t even officially declared before the Labor frontbencher Linda Burney said the country needed an election now rather than next year given Morrison had now lost his parliamentary majority. “This is an unprecedented result for the Liberal party, and I think Mr Morrison needs to think about calling a general election,” she told the ABC. A jubilant Phelps told a sea of supporters at her victory party in North Bondi: “My friends, we have made history”. She said when she began her campaign for Wentworth, friends told her it was an impossible task, that winning the seat “would be a miracle”. Whatever advertising credential ScoMo claims to have, he is undeserving of leading the fair country, as he still believes in the 4,000 year-old legend of Noah's Ark and does not seem to even bother understanding the science of PRESENT global waming. This was the major issue that did him for a late dinner last night (20/10/18). Newly elected independent Kerryn Phelps has pushed back against Labor's call for an early election, saying the Coalition should serve a full term unless there are "exceptional circumstances". The Liberal Party suffered a swing of almost 20 per cent against it in last night's Wentworth by-election, with Dr Phelps claiming victory, meaning the Morrison Government loses its majority of one in the House of Representatives. Dr Phelps has claimed victory in the by-election, but the margin narrowed to fewer than 900 votes this morning as postal votes are counted. 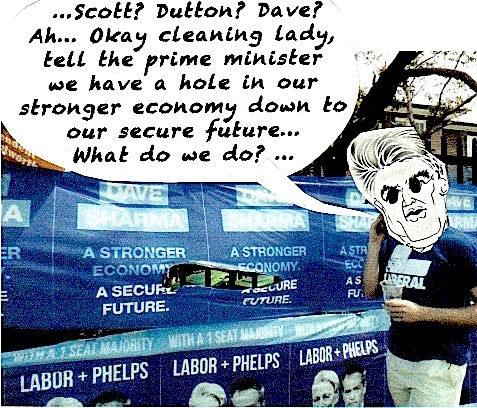 Mr Sharma conceded defeat last night, but this morning Prime Minister Scott Morrison said "we will simply wait for that normal democratic, robust and credible process to follow its course". "It is down to just over 800 votes and if it gets as close as 100 then an automatic recount is triggered under the normal rules," he said. "I am not saying it will get to that." Labor's Manager of Opposition Business Tony Burke said the Coalition told voters that an independent victory in Wentworth would bring more uncertainty to Canberra. The former prime minister, Malcolm Turnbull, has touched down in Sydney this morning, as the fallout continues from the Liberals defeat in Saturday's Wentworth by-election. Mr Turnbull travelled to New York with his wife, Lucy, after the Liberal Party's leadership spill that toppled him from the nation's top job in August. Scott Morrison, who replaced Malcolm Turnbull as PM, downplayed his former colleague's decision not to help the party campaign in Wentworth. 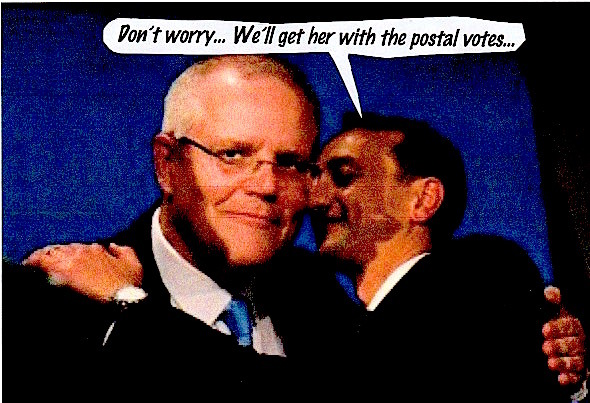 Mr Morrison said Malcolm Turnbull rejected offers to help Liberal candidate Dave Sharma, including writing a letter of support. The Australian share market wiped out all its gains from the past 12 months and entered a technical "correction" on Thursday following a massive sell-off on Wall Street overnight. The broad All Ordinaries index dropped 2.8 per cent to 5,759 points — which is about $52 billion in market value. The benchmark ASX 200 has retreated by a similar amount to 5,664. It has fallen by more than 10 per cent since its peak in late-August and is down 7 per cent since the start of the year. "It's not outlandish now to call it a correction," IG market analyst Kyle Rodda said. "Whether it starts manifesting in what we consider to be a bear market, which is where we start to see the selling outweigh the buying or the markets falling rather than rising as a trend, it remains to be seen. Read from top. See toon. The night of the bye-bye election in Wentworth was punctuated by a rant of Pentecostal proportions by PM SloMo. No doubt he was trying to gee-up the dejected gathering at the InterContinental in Double Bay, grazing on deflated arancini balls and sucking warm sav blanc. In the process he forgot to congratulate Kerryn Phelps on winning. “I knew there would be tough days and there would be great days. Today is a tough day, but the great days are coming,” the old clapper bellowed, accompanied by much jabbing of fingers and pumping of fists. By this stage you’d think SloMo would have run out of vacuous clichés but, no, there were more. “We believe it is every Australian’s duty to make a contribution and not take a contribution,” he proclaimed, and added something about Liberals being people who get up early in the morning. No wonder Gadfly is not of the faith, being rarely out of bed before 8am.